It is time to start harvesting and preserving herbs for a good supply during winter, especially if you love robust soups and stews. If you have not thought of it before, try harvesting according to the moon. Herbs for drying should be picked during a waning moon. During a waning moon the sap moves down, which means that the stems and leaves are not as juicy and will dry more easily, with less chance of fungus. If you are picking for immediate use, it is better to harvest during a waxing moon because the sap is rising and fruit, flowers and leaves will be of a better quality. Pick leaves and flowers for drying between 10 am and 12 noon. By then the dew on the leaves has dried, with less risk of fungus developing. Discard any leaves that are diseased or damaged. Most perennial aromatic herbs retain their flavour when dried. This is the easiest, cheapest and most effective method of preserving them. Annuals such as basil, mint, parsley, coriander leaves, and rocket lose their taste when dried. It is better to preserve them by making a pesto that can be frozen, or chopping the leaves and freezing them in ice trays with a little water. Infused herbal oils and vinegars are another delicious way of preserving herbs. The oil can be used to flavour cooking and used in salad dressings. Chilli peppers, green onions, and coriander. This can be as simple as putting the cut herbs on brown paper in a cool room. Another way is to tie the herbs in a bunch and hang them up. Put a brown paper bag over the herbs and tie that up as well. The paper bag keeps any dust or insects off the herbs while they are drying and any loose pieces will fall into the paper bag as they dry. Pesto can be frozen and is the ideal way of keeping the taste of summer alive. Some people choose to omit the Parmesan cheese and only add it after the pesto has defrosted but others don’t worry. It is a matter of taste. Place all the ingredients in a blender or food processor and blend until it reaches the desired texture. Taste and season. Store in required quantities and freeze. An even quicker way to preserve the freshness of herbs is to chop the leaves finely and add just enough olive oil to cover the leaves. Store in a sterilised air tight container in the refrigerator. This doesn’t have as long a shelf life but is so convenient. Just add a dollop to the dish as you are cooking. In this way you can combine herbs to make an Italian mix (basil, marjoram, parsley), chicken mix (sage/lemon thyme or rosemary, parsley, chives, garlic), pizza mix (oregano, chives, parsley) or a stir fry mix (coriander, lemon thyme, parsley and chives). 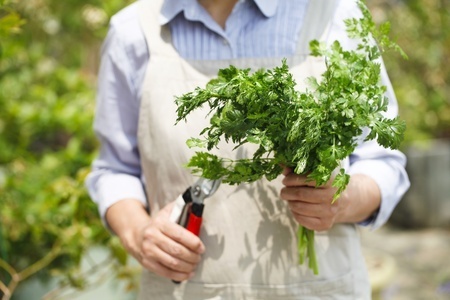 Posted in Growing Herbs and tagged dry herbs, flavour, harvest, herbs, preserve, recipe.